After the success at Arco madrid 2012 with his installation ‘Superstructure’, Niens shows a brand new site-specific, large-scale installation called ‘Revolver’. This time, Niens has avoided any of the physical ‘obstacles’ that he used in his previous site-specific installations, such as narrow passages, heavy-weight or closed doors. 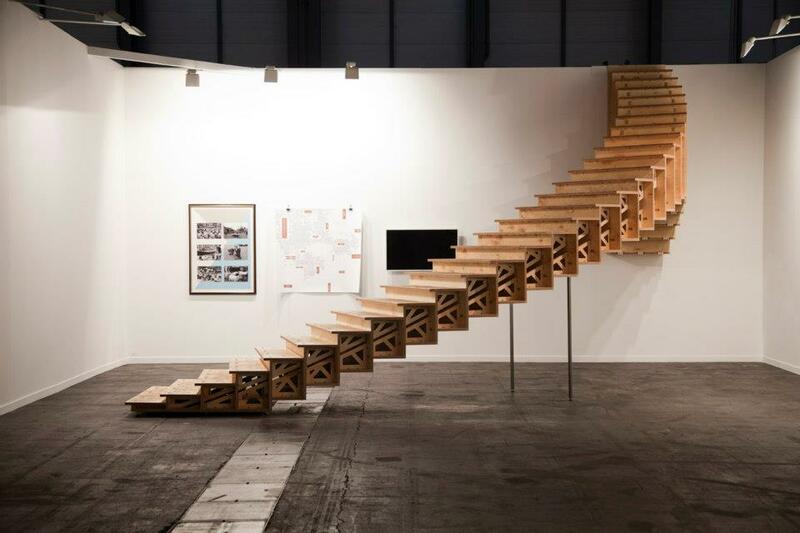 For Arco madrid 2013 he has chosen to make an installation/staircase, a well-known shape, as a structure in which the visitors are invited, instead of challenged. Inspired by the structure of the art fair and the function of the space, the artist has made an extensive intervention. The object is almost entirely in the service of a form that is usually eliminated. The fair visitors will automatically walk up the stairs and are drawn to look again at the space. The staircase leads to a ‘non-space’, almost a room that is not used by the fair. Thus Niens shows visitors the artificial world of the art fair and – in a way – the backside of reality. ‘Revolver’, in its entirety, has been made of sheet material, which has accurately been carved into wooden elements, using CNC milling techniques. The architectural objects of Niens create spaces that seem without function at a first glance. Physical obstacles such as narrow corridors or locked doors increase this feeling but are at the same time the core of his work. Fascinated by conventions and the human (group) behaviour, Niens searches for limits with his work and confronts the audience with his idea about privacy, determination and solidarity. He constructs interventions which change their meaning of space both inside a building and in open air. .